With a slimmer fit ideal for city-living, the Refined Short Wellington Boot features a tailored shape, and is constructed from fewer rubber layers for a more lightweight feel. 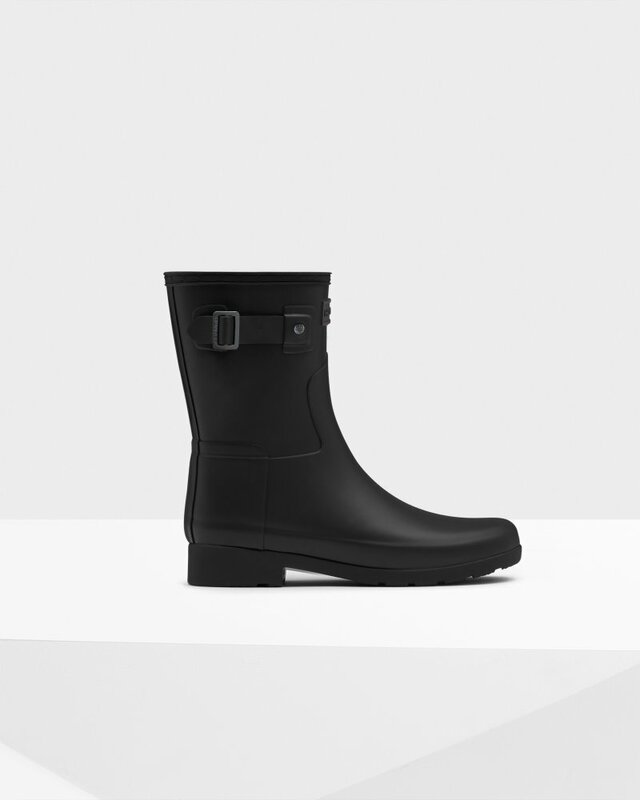 Handcrafted and fully waterproof, this women's wellington with a clasic black matte finish seamlessly blends practicality and style for a chic wet weather look. A tonal logo has been introduced to this Refined boot. During a period of transition, the product you receive may feature the red Original logo or the new tonal logo. Rated 5 out of 5 by zedtwed from Could not be happier! So pleased with my Mary Poppins X Hunter short wellies. Slim fit was perfect for me and with the added welly socks! Rated 4 out of 5 by Gigi from I love it I just bought this hunter boots,it my first pair hunter boots I love it. Rated 5 out of 5 by NGreer from Great Rain Boots! Love these boots! Very cute, comfortable and practical. The refined version works well for me as I have very narrow feet and ankles and am quite petite (5’3”). I also have the tall version of these boots and they are the best! Rated 5 out of 5 by ashdawn from Great Fit! Classy Style Love this boot! I've been wearing the tall refined boots for years! Decided to try the short boot this year & I am so glad I did! Same classy style that can be dressed up or be casual. I've gotten so many complements! The style and quality is perfect for whatever mood Mother Nature might be in without compromising your look. Highly recommend! Rated 4 out of 5 by Paradise613 from Great Boot This boot is very nice color and design true to display. I wear a 7 however the 7 in this boot seems to be a bit narrower than other hunter boots that I have. I would suggest if you have feet that may be a little wide to get a size larger. I took the insert sole out and it fit fine but it would have fit better with one size up. Overall it is a great boot aside from misjudging my fit. Rated 5 out of 5 by Sparkle Grey from Cute and comfortable I’m wearing these right now in the middle of a rain storm and I must say they are the best! I love the slim fit these have and it’s perfect not having water get inside of them because it’s fit to my legs. Very comfortable as well it’s like I’m walking on a cloud. I’d recommend these to anyone.